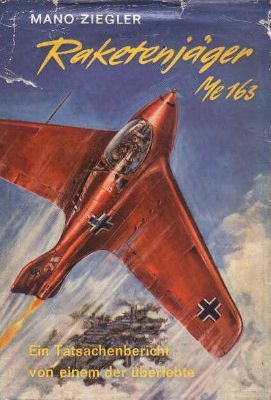 The cover of the 1961 first edition of Mano Ziegler's book 'Raketenjäger Me 163'. 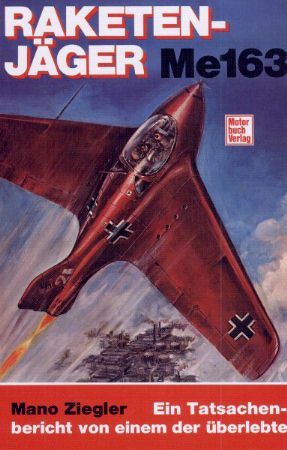 Cover scan of the 1996 issue. Don't let the cover drawing confuse you that the all-red one looked like this. The tail code 'White 21' and the Jägerfaust vertical launching tubes are spurious details. The launch tubes are most likely wrongly located, right where the C-Stoff tanks should be. Some remarks: chapters 4 and 5 should switched, and Pohs did not die in a Me 163B, but in a Me 163A.